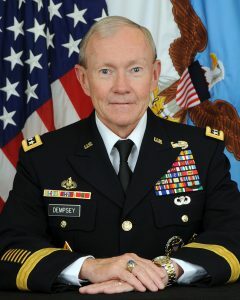 Army Gen. Martin Dempsey gave National Guard leaders an abridged outline of the U.S. military strategy for 2020 during the Guard’s Leadership Conference, as reported by the Defense Department. The chairman of the Joint Chiefs of Staff indicated that leaders must look beyond near-term problems, to address them, but to also keep an eye on the future in order to build the forces necessary for national defense. “We’re never going to try to build a force that’s only capable of doing one thing at a time,” Dempsey said. This strategy is opposite of the Cold War strategy where the military combated the Soviet Union and afterward was called to be able to conduct two major contingencies simultaneously. In addition, geographical priorities are a driving force behind the strategy, according to Dempsey. “We’ve been focused and we’ve prioritized the Middle East, but there is every reason to believe that the next decade will see demographic shifts and economic shifts and military shifts into the Pacific,” he said. He also indicated that general operations and special operations have changed so that they are merged into combined missions. Lastly, Dempsey suggested the strategy to deal with cyber warfare, saying that it can’t be a “one-off problem.” He labeled the cyber world as a vital aspect of consideration for the military and an area where more needs to be done.